Silver Spring portable aluminum threshold ramps provide easy access over doorway thresholds, single stairs or steps and short rises. Great for power chairs, wheelchairs, mobility scooters, and foot traffic with shoes. 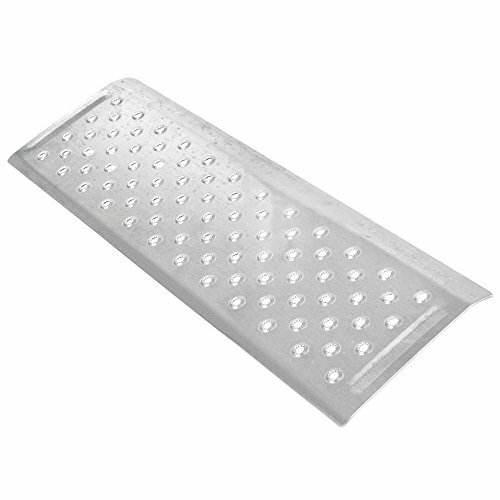 The specialized EZ-Traction double ribbed plate surface is designed for superior grip with power wheelchair or mobility scooter wheels in all weather conditions. Each threshold ramp measures 10" x 32" to fit standard home doorways and weighs 4 lbs for lightweight carrying. Includes pre-drilled holes for optional permanent mounting application. Durable aluminum construction supports up to a maximum 600 lb capacity - Made in the USA by certified AWS welders.